You’ve seen it before — women talking about a boyfriend. Bubbling with excitement, she raves about her kind, handsome and bright new man. When her friend asks about his apartment, however, the mood and smile fade. “… bachelor pad,” she whispers. Mr. Wonderful has a blemish, and it resembles a big, brown easy chair in harsh lighting. Some guys are pros when it comes to interior design, but ask the average male about conversation areas and throw rugs and they’re lost. Blame it on that strong left brain, a tendency toward color-blindness or lack of interest, but the fact remains that many men could use some help getting in touch with their decorating side. The key to a better looking home is simply understanding some simple basics about your taste and your home. Take a look at your wardrobe. The clothes you buy are often the colors you like best, so keep them in mind when choosing paint, wallpaper and draperies. Walls painted in a color you’d never wear can lead to an awkward-looking space. Take a trip to your hardware store and pick up every paint chip that catches your eye. Once you’ve decided on the wall colors, it’s time to take a look at the “window treatments,” which includes things like draperies and blinds. They may sound frilly, but draperies can be classic, simple shapes that are more gender neutral than girly, especially if you use geometric patterns and rich colors. The same pinstripes, hounds tooth, corduroys and argyles you love to wear are also perfect on walls and windows. It’s also a worry to invest in nice furniture their future spouse may not like. As the average age for marriage continues to rise, men are finding themselves with high discretionary income levels and craving spaces that are homey, personal and acceptable for entertaining friends or significant others. For married men, the issue isn’t where to start, but how to stop. Their wives, that is. Yesterday’s man may not have cared if his home was pink and green, but today’s man does, and he’s increasingly more involved in furniture buying decisions. 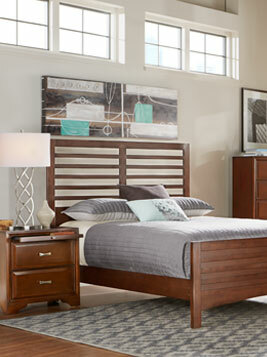 Today’s popular furniture styles are direct and comfortable. Mixing in a few unexpected pieces, such as a vintage-style mahogany desk or Chippendale chair, can set the tone of a room. When most things are decidedly masculine, everything else — even a vase of flowers — takes on a deeper tone. It’s like being in a conversation where one person has an accent and suddenly everyone starts speaking that way. Don’t feel you have to decorate entirely in dark woods and heavy furniture. In fact, mixing a few floral, light colored or otherwise “feminine” items into your room will lend contrast and make it more interesting. You want the look to be masculine, not barbarian. Like most people, you may have a favorite chair. Perhaps you inherited it when your mom went “tropical” at home and Dad’s brown velveteen wonder had to fly north. Or maybe you bought it at the coolest store in NYC’s SoHo district as a declaration of your adulthood and first real paycheck. No matter how you came by this remote-gobbling chum, it doesn’t have to be the focal point of your room. Distract the eye with a mantel topped with photos of friends and family, accent it with a curio cabinet filled with odds and ends from hobbies and accomplishments, or enhance it with a small recessed light in the ceiling perfect for reading. And speaking of lighting, reserve the bright lights for tying flies. Put dimmers on everything and banish the fixture without a shade to the basement. 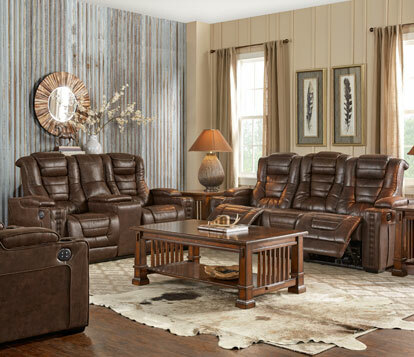 While there are many terrific black leather sofas on the market, they aren’t the only choice for masculine style. Consider the following for tough but luxurious designs. 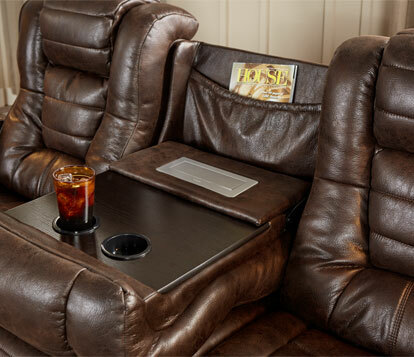 For a casual and rugged look, choose a leather sofa in "bomber jacket" brown. For a traditional style, look for upholstered pieces that resemble ties; think pinstripes, paisley and silk. For a contemporary spin, consider distressed velvet that’s more masculine than you’d expect, especially in mahogany or burgundy. If modern is more you, look for sleek designs accented with chrome legs. And don’t be afraid of country. Plaids and denims are true Old West rustics. When it comes to furniture, one size does not fit all. No matter what style you choose, look for deep seats if you’re tall, wide seats if you’re stocky (think chair-and-a-half size) and durable fabrics if you tend to tackle more often than sit. An ottoman with an easy chair is a comfortable way to put your feet up, and it can be used for extra seating when needed. It’s time to literally pump up the volume. Inside your handsome entertainment center, you’ll want a great stereo, which brings us to the subject of sound. For best sound quality and fewest neighbor complaints, consider acoustical wall and ceiling panels to absorb rather than reflect sound. These panels are rated according to a noise reduction coefficient, or NRC, that tells you how much sound they absorb. An NRC of 70 means the material absorbs 70 percent of the sound that hits it. Carpet, upholstered furniture and window treatments will also help reduce the reverberation of sound. Most guys like having a place they can escape to. The leader of the old-boy-style wish list is currently the smoking room — complete with a humidor and pool table, decorated in true throwback style with leather chairs and mahogany paneling. It’s the coolest clubhouse ever. Just be sure to include a good ventilation system and don’t be surprised if the ladies like it as well. Whether you’re furnishing to impress your friends or your dates, the move to a “grown-up apartment” can be as exhilarating as driving your first car. You’ll only get better with practice and your confidence is sure to grow with time. But coming home to your welcoming den of security and comfort is sure to make a relaxing end to your day.